If you find yourself on a walk on the high mountain plateau of Flåten, with the mountains Skarvarna at your back, you may stumble upon a small little stream, dancing its way along the tree line, bound for the distant lakes in the valley below. Probably unbeknownst to you, this stream was once upon a time named Mariabäcken after the wife of an artist who spent many days and many months in these mountains in years past. If you follow the stream downhill, as one sometimes tends to do, you will come upon a series of houses, nestled among an advancing line of gnarled mountain birches. The first house is a traditional looking log cabin with a peat-moss roof, in typical Norwegian style. The second one is even harder to see, a Sami Kåta, completely covered by peat moss and a few trunks of the straightest birch trees you are able to find in the area. Continue your stroll along the meandering stream and you’ll finally arrive at a collection of houses: a large dark-stained house on stilts, a one-room guest-house, and a playhouse acting as an outhouse. Welcome to our home at the tree line. 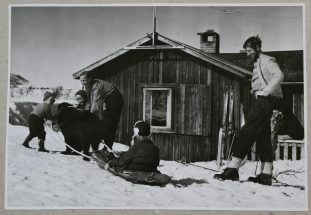 Six years after the end of World War II, in 1951, Ragnar and Maria Johansson built themselves a home in the mountains of Härjedalen. 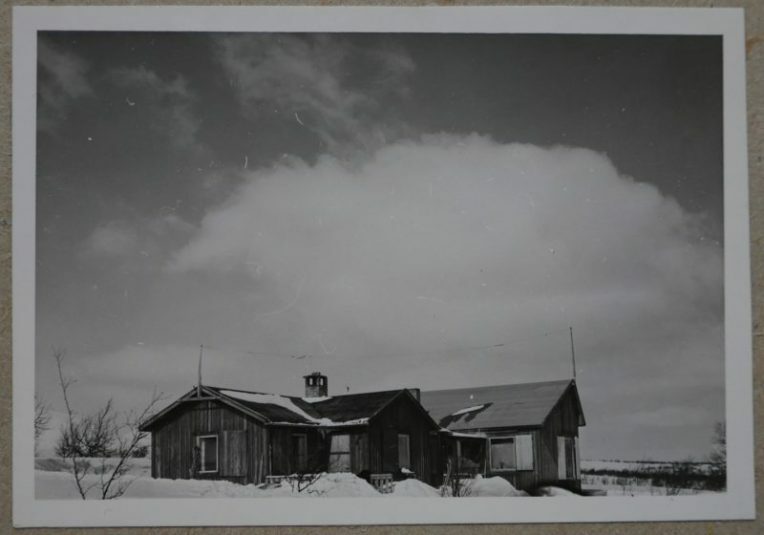 Not having built a house before, they employed the help of Ragnar’s brother, the inventor and perception psychologist Gunnar Johansson, who also had never built a house before, but had a knack for figuring things out. 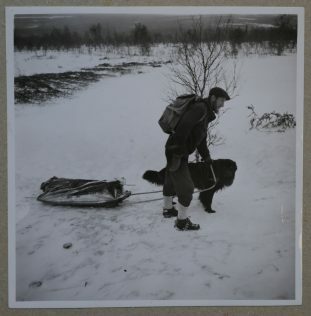 Along for the adventure was their one-year old daughter Maj.
Ragnar på Flåten, a documentary from 1981 about Ragnar Johansson, Isak’s grandfather. 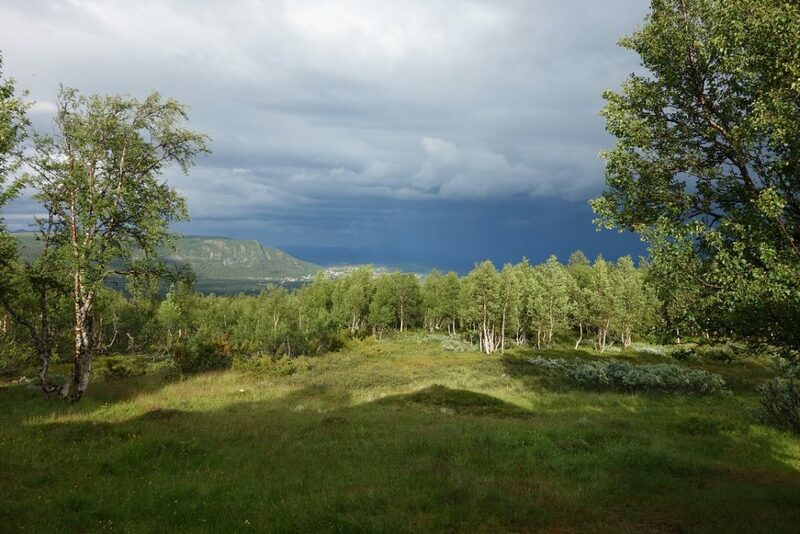 Since those early days, Ragnar and Maria’s daughters, Maj, Eva, Sara and Boel, have continued to care for and enjoy the cabins on Flåten, spending long summers here. Now, 67 years after the first house was built, we have decided to leave our jobs in the city to make the tree line our home for a year. Joining us for this adventure is Embla, a black flatcoated retriever with an enthusiasm and gusto unusual for a lady of her mature age of nine years. The houses are in need of continued care, which is one of the reasons we are here. We also hope that this year may offer an opportunity to reflect upon how the history of this place (from time immemorial up until the recent history shared above) but with an eye towards the future and how we may invite others to share the joys, insights and strength that this place has offered to us over so many years.